OK, I’m joking. We’re not even married, so how could we get a divorce? 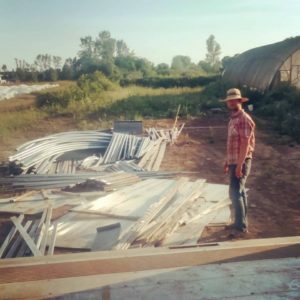 The title of this post was just the thought that popped into my head as Brad and I unloaded these used greenhouse parts from the back of a U-Haul truck at the end of June. It was a Saturday afternoon, close to 40 degrees, I was 6 months pregnant, and we were rushing to empty the truck before our 4-year old returned from an outing with his grandfather. Not the ideal way to spend a summer weekend, but this is what we signed up for… right? One might think (as I did) that building, heating and growing in 4 greenhouses through the winter would be enough, at least to keep us busy for our first few years at this farm. But Brad is a big-picture thinker, always looking ahead to the next goal. It’s hard work bringing him back to the details of the present moment day after day, but without his vision we would never have gotten to this point. 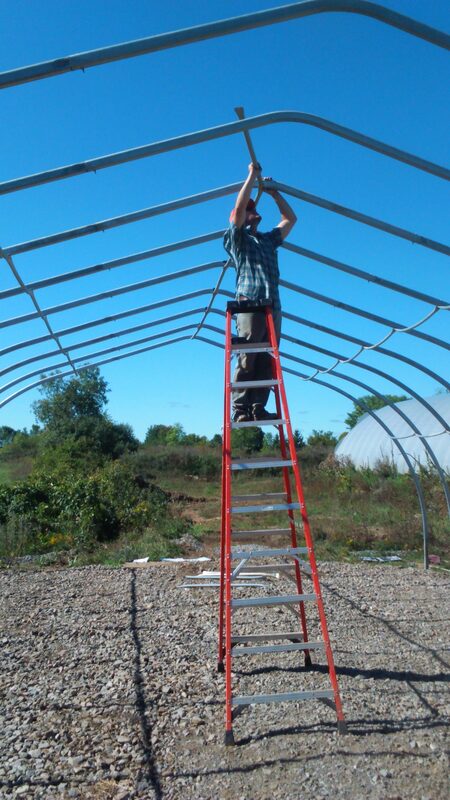 We decided to build a fifth greenhouse after 3 springs of sub-par seedlings. 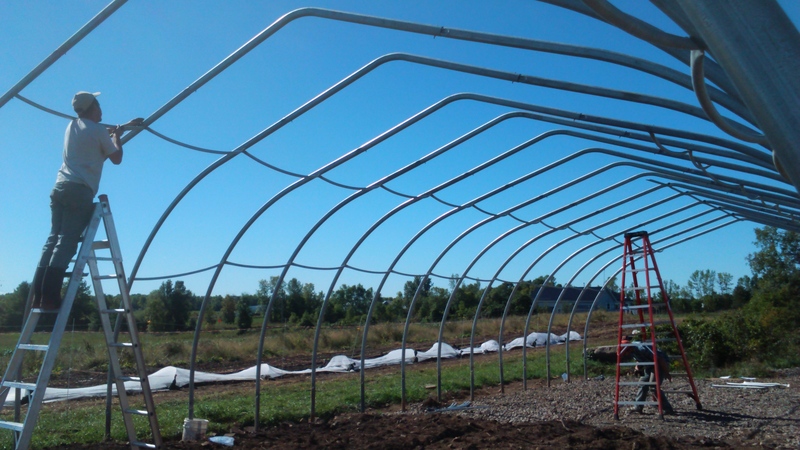 We turn off the soil heat in our existing greenhouses at the beginning of March. 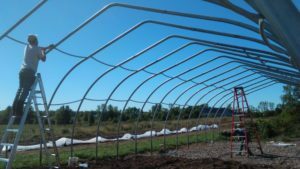 By then, lengthening daylight hours and solar gains in the greenhouses can support rapid growth of our cold-hardy greens. But growing new seedlings, to transplant into greenhouses or fields throughout the spring, is a different matter. These seeds are grown in trays, require higher constant soil temperatures for germination, and warmer air temps for the new plants to grow. Many vegetable farms heat only their seed-starting greenhouse, and only in March and April for just this reason. We were starting our seedlings in unheated greenhouses, where they were suffering, and taking up valuable spring salad production space. It felt like some transplanted crops never caught up from their rough start. Enter Brad’s never-ending Kijiji search, which soon turned up a good deal on a used greenhouse near Guelph. We dropped Brad off at the Via Rail station in Smiths Falls at 6 am one morning, and he arrived back at 10 pm with a U-Haul full of greenhouse components. Major discussion was required before unloading the next day: how would we heat this new greenhouse? How close could we put it to the others without blocking the sun? How would we get power and water to the new building? What other future land uses did we need to consider in siting it? What were we thinking trying to farm anyways? I felt like both my decision-making AND unloading skills would have been greatly enhanced by a cold beer on such a hot day, but in my second trimester it was not to be. Eventually, we figured out where to put it. 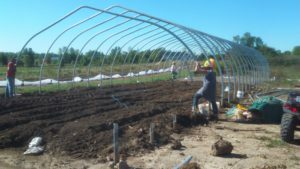 We also decided that one-third of the structure will be walled off and heated for seed-starting in the spring, while the other two-thirds will be left unheated, allowing for additional greens production in the spring and fall. The heated section will use a water-to-air heat exchanger, transferring energy from our wood boiler to underground hot water lines to the indoor air. The good news was that once unloaded, Greenhouse #5 has gone up much more quickly and smoothly than the first four. Turns out we’ve learned a lot about how to excavate and square the foundation, hire professional rock drillers, cement the ground posts into holes and assemble the arches. Once our fall staff showed up, our awesome team got that puppy up in no time. We’re almost ready to cover it with plastic and set up the seedling tables inside. Nearing the end of my third trimester, I’ve stepped back from construction jobs on the farm, which has also greatly reduced the risk of divorce. But I’m pretty sure this baby will be helping to seed a whole lot of little green babies in our new greenhouse this spring.